Premium interconnect cables from some of the worlds best manufacturers are available at TTVJAudio.com. Single ended RCA or balanced XLR terminations connect your Audiophile gear, delivering your audio signal transparently from one point to the other. 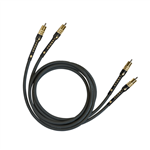 Cardas, Audioquest, and Dimarzio cables all deliver high quality, well built cable for the high end listener!